Why I Love is a series of guest editorials on GamesIndustry.biz intended to showcase the ways in which game developers appreciate each other's work. This installment was contributed by Chris Payne, managing director at Quantum Soup Studios and former senior game mechanics programmer at Traveller's Tales. I'm writing this largely for the benefit of everyone who wasn't lucky enough to enjoy this classic back in 1992. Ultima Underworld: The Stygian Abyss was released during my A-levels, and by the time Underworld 2: Labyrinth of Worlds arrived, I had a glorious summer between finishing my exams and leaving for university to escape into Britannia and beyond. I did not see a lot of sunshine that year, and the effect of such ground-breaking games on me at a time when I was just setting out to become a developer was profound. Ultima Underworld's 3D world was hugely innovative, though not often imitated. Let's start with the most obvious technical accomplishments. Underworld was the first fully textured true 3D game world. In the days before 3D accelerators, the CPU had to do all the work, and Underworld worked it to the limit. To be fair, it wasn't the best 3D engine ever, but it had ambition. At a time when John Carmack was hard at work making clever compromises to make Doom run at a good lick, Looking Glass just went for it. To keep the frame rate up, they reduced the 3D window to a third of the screen area, and filled the rest with your inventory. Earlier faux-3D RPGs such as Dungeon Master and Eye of the Beholder had established this as an acceptable compromise. Textures were mapped without perspective correction, making surfaces swim as the camera approached. My lowly 386 PC was well below the recommended spec despite its enormous 4MB of RAM - so I had to drop the quality down to merely dithered floors and ceilings. Despite this, the game drew me in like nothing before. To navigate this truly 3D space, they created a completely new control method, moving your viewport by clicking on different regions of the 3D viewport, much like some touchscreen apps do nowadays. It was clumsy enough that it was never copied by other games - but it was ambitious and delivered complete freedom to look up and down, rotate, strafe, run and jump...all on mouse only. At the time it was a workable solution, because no-one had invented a better one. Underworld's innovation was making the Stygian Abyss feel like a real place where lizardmen and goblins lived their lives. Looking Glass made excellent use of their 3D world. Their dungeons were not a linear sequence of mazes to be cleaned out and left behind, but Metroidvania-style labyrinths. There were grates to be opened from the other side, cliffs to leap down that you couldn't climb back up, pits that dropped you into the level below...and it was populated not by a random menagerie of monsters, but small communities with interesting stories to get involved in. FTL's Dungeon Master had introduced many of these features, but too often it felt like the dungeons were just puzzles to solve - Underworld's innovation was making the Stygian Abyss feel like a real place where lizardmen and goblins lived their lives. This feeling was reinforced by the generous affordances the game provided - doors could be unlocked, picked, bashed in or burned down, enemies could be bargained with, fought or simply pushed into water or lava. The sequel expanded on this by introducing a multitude of different worlds: a goblin prison tower, a frozen city, a sandstone keep floating above a desert (supported by flying monsters in the basement which you could kill, crashing the keep and killing everyone! ), a weird alien dimension... evocative worlds that still linger in my imagination. Details such as books in the prison tower foreshadowing the trap-riddled Tomb of Praecor Loth made the universe feel rich and interconnected. And as with those flying monsters, Looking Glass had the confidence to let the player break the game, and show them they were free to make even bad choices. Supporting this rich world was a superb map system. Where most RPGs expected players to create their own map, Underworld not only auto-mapped your exploits beautifully on virtual parchment, it allowed you to annotate the map freely and browse the entire game world - the perfect blend of convenience and immersion. Even so...I still have the classic poster map that came in the box! All this was topped off with Ultima's rune-based magic system. This had been honed in previous top-down Ultima games, but it was my first experience with it. The ability to figure out new spells by combining runes in logical sequences was exhilarating - and of course I could then write the spells I discovered into the corners of the map for future reference. Finding a new runestone would prompt a ten-minute session of hiding in a quiet corner experimenting with new spells, and the satisfaction of "inventing" a fireball by combining the runes for "MOVE" and "FIRE" was great. The existence of a high-level spell that killed every living thing in the game indiscriminately reflected that commitment to honouring player choices, even the bad ones. Any of these innovations would have made the Underworld series noteworthy. Some of them were logical evolutions of earlier work, and some were bold experiments that were quickly surpassed, but to have so many fresh ideas AND still deliver the sophisticated storylines for which its parent series was legendary makes it a truly landmark accomplishment. 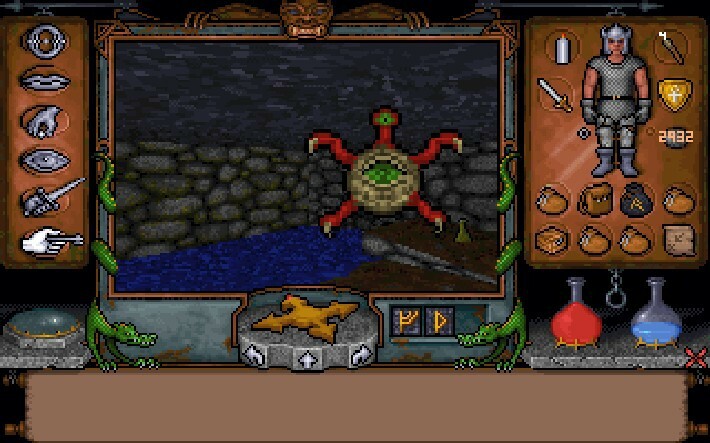 For me, what Ultima Underworld delivered was the idea that sometimes, reaching for the stars can result not in burnt fingers, but in a shining jewel. This was a fantastic game! My all-time favorite adventure game! I remember that on a certain level of the dungeon, you encountered lizardmen. They spoke in their own lizard language, and you could not understand what they were saying at first. Then you found a human prisoner in a cell that knew how to speak lizard. If you told him a lizard word, he would translate it into English. After speaking to a couple of lizardmen and going back to the prison to ask for word translations, you ended up learning their language! @Louis De Carufel: Yeah, I should have mentioned that too, although - perhaps because I'd seen it done before in Captain Blood - it wasn't one of the moments in UUW that still sticks in my mind.